Equipped with telepresence technology,Okeanos Explorer reached audiences around the world who participated in the expedition through live streaming Internet video. As members of the public ashore watched live video from the ocean bottom, they became “citizen explorers,” sharing in the discovery with maritime archaeologists, scientists and resource managers from a variety of federal, academic, and private organizations. A variety of artifacts inside the ship's hull relates either to daily life on board or to the ship’s cargo. 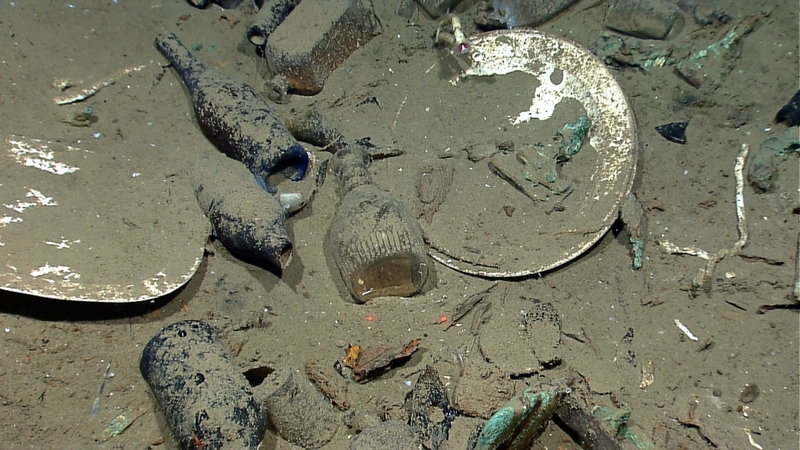 Artifacts include ceramic plates, platters, and bowls; and glass liquor, wine, medicine, and food storage bottles of many shapes and colors (some with the contents still sealed inside). The expedition also discovered areas exhibiting rich biodiversity. At the base of the West Florida Escarpment, a steep undersea cliff, explorers found a “forest” of deep corals, several of which were new to scientists on the ship and ashore. For several days the expedition team also imaged deep-coral communities in the vicinity of the Macondo oil spill site. On another part of the expedition, team members designed and installed a device on the ship’s undersea robot system, or ROV (remotely-operated vehicle), to measure the rate that gas rises in the water column. An anemone lives on top of a musket that lies across a whole group of muskets at the site of the shipwreck. Okeanos Explorer is equipped with: a state-of-the-art multibeam mapping sonar; the Institute for Exploration’s Little Hercules ROV, which made 29 dives; and telepresence technology that uses satellite and high-speed Internet pathways between ship and shore, allowing scientists ashore to participate in the mission in real-time, and general audiences to be “citizen explorers” as the mission unfolds, live. Background information, web logs from scientists at sea and ashore, video clips, still images, and education lesson plans describing the expedition are available online . Partners in the 2012 Gulf of Mexico expedition included a number of NOAA offices, BOEM, Bureau of Safety and Environmental Enforcement, C&C Technologies, Florida Atlantic University, Geoscience Earth & Marine Services, Louisiana State University, Mississippi State University’s Science and Technology Center at Stennis, Naval History and Heritage Command, NOAA Northern Gulf Institute, Pennsylvania State University, Temple University, Tesla Offshore LLC, Institute for Exploration, University Corporation for Atmospheric Research Joint Office for Science Support, University of New Hampshire, University of North Carolina Wilmington, University of Rhode Island, University of Texas at Austin, and Woods Hole Oceanographic Institution. BOEM manages the exploration and development of the nation's offshore energy and mineral resources. The bureau seeks to balance economic development, energy production, and environmental protection through oil and gas leasing, renewable energy development and environmental reviews and studies. The NOAA Ocean Exploration Program is the only federal program dedicated to systematic exploration of the planet’s largely unknown ocean. NOAA Ship Okeanos Explorer is operated, managed and maintained by NOAA’s Office of Marine and Aviation Operations which includes commissioned officers of the NOAA Corps and civilian wage mariners. NOAA’s Office of Ocean Exploration and Research operates, manages and maintains the cutting-edge ocean exploration systems on the vessel and ashore. A map produced by NOAA Ship Okeanos Explorer's sonar shows the West Florida Escarpment, a steep undersea cliff. The base of the escarpment (2,600 meters deep) is shown in blue with the upper rim more than 600 meters above. ROV dives explored the physical structure of the seafloor and biodiversity on soft and hard bottom areas. NOAA's Seirios Camera Platform, operating above theLittle Hercules ROV, images the ROV and an anchor inside the hull of a copper-sheathed shipwreck in the Gulf of Mexico. The wood has nearly all disintegrated after more than a century on the seafloor.